I am very happy with my curtains BUT I was not expecting them to have a sheen. I thought they would hv a texture. They are just like silk... I wanted a heavy material.. They do the job that they are supposed to. They are heavy, just shiny. Dress up the look of any window in your home with the Aurora Home thermal insulated blackout grommet top 84-inch curtain panel pair. These panels feature a polyester construction that is thermal insulated and blocks unwanted light. Available in a variety of colors, you're sure to find the perfect match for your decor. The good news is that these curtains are just about what the description offers. They are petroleum-based fabric that serves its darkening and insulating purposes well and even looks good enough. But they certainly offer no glamour or upgrading. In fact, one of their virtues is that they seem to recede into the background of the room. If I remember to pull them, the following morning the room is less chilly than if I do not. I like that. I will say that if I wanted badly enough to keep things warm or dark, I would buy two sets and have them hang more loosely. As it is, I am covering 86 inches of window with 84 inches of curtain and getting an acceptable minimum of return. Two other notes. The grommets are good and large making it easy to open or close the curtains with little effort. And, the olive color I ordered was much as shown and is not garish or cheap looking. I'm satisfied all 'round with this purchase including the rapid shipping and condition of the curtains on receipt. Great curtain panels. Color as shown. Aurora Home Thermal Insulated Blackout Grommet Top 84-inch Curtain Panel Pair - 52 x 84. Would recommend to all Overstock.com customers! LOVE this product. Thick, luxurious fabric - same color front and back - that hangs like a dream. Quality and value in this product. Love it so much, I have purchased 3 sets. Tip: to remove packing wrinkles, toss in dryer and let spin for 10 minutes. The wrinkles will fall out when drapes are hung. The curtain color is significantly darker in person than represented (beige, looks more like taupe or tan). I have had blackout curtains before that truly were impervious to light, but these show a little light through the material of the curtain. However, they are much more naturally draping than the truly blackout curtains I had before. So, these curtains do dim the room quite a bit, but you can always tell if the sun is up or not. The material has a nice feel to it and looks very substantial, nice texture. Too bad they missed the color, I find the beige much too dark for my decor. Overall I find this product functional but not quite as represented, but I will live with it for the price. I bought 2 sets of these for 2 different rooms, brown and olive. The colors matched the website exactly (actually, I was hoping the color on the website would be wrong, because I prefer a very dark chocolate brown, but they matched the color on the website exactly) They are soft and the wrinkles came out easily. One set came with the tie backs and the other did not. The only thing is that they are maybe an inch shorter than I hoped. The dimensions are for the entire panel, but with the grommet hole being about an inch from the top, they then hang an inch shorter. No big deal, I'm used to it now. I read many of the reviews before purchasing these curtains and still had questions. For those concerned shoppers like myself, here is everything you need to know: Blackout quality--The curtains work well at blocking light. Short of an airtight cement wall in front of your windows, I dont know what else you could possibly expect from a curtain! Yes, it also helps if your curtain rod is closer to your window. I bought these for my nursery for easier nap time. One of the windows gets direct sunlight beaming through... you CAN see some light coming through the curtain when this is happening, however, the overall room is pretty dark. If it is later in the afternoon and the sun is not beaming through, the curtains will block out ambient light almost completely. Also, I purchased the lightest tan color available. I imagine the darker colors may have a touch better blackout quality. Speaking of color, I purchased the light tan ones and they are light tan, as I expected, and just as pictured on my computer... Thermal Quality: I live in Denver CO and have only had them through the winter months. I have not noticed a difference in the temperature of the room. Appearance: gorgeous!! Totally transformed the look of the room! Overall they are gorgeous curtains that block a lot of light for a good price and I highly recommend them!! THE BASICS: Bought these for 75-inch doors that open onto a deck. It gets cold in Summit County, CO, so I've been looking for curtains that can insulate when it gets down to negative temperatures. As I just hung them, can't say how they perform on that front, but fabric seems heavy enough to keep the cold out. SIZE: I've heard it said that you need to buy curtains that are 2.5 times the size of the window being covered. Perhaps, but I like that these cover the windows with a little left to spare, and the rest of the time, hang without a lot of bulk on either side of the window. FEATURES: Antique brass grommets were tough to match with a curtain rod, so ended up buying solid black with fun finial from overstock.com. Dislike the plastic end, but no one can tell. Antique brass looks great with black. COLOR: These were true to color, something I was very nervous about. They blend into the rest of the room while adding a bit of elegance to the decor. ALSO: These come with pull-backs, as noted. Not sure others I was looking at do. Nice to have this, but keep in mind you have to purchase hooks to attach pull back to BOTTOM LINE: Really like these so far, particularly compared to Themalogic ones purchased from Sierra Trading Post. Cheaper, yes, but definitely noticeable that they cost less. If only can find these in size I need for the other windows! I ordered these for my living room and have them hanging now. They are of high quality and look really nice. I ordered the burgundy and the color was what I expected. I needed 2 Pair or 4 panels for the 2 side by side front windows (each window is 36 inches wide) and also 2 pair for the back large window (72 inches). One pair looked sparse with little gathering so I reordered. The drapes do a good job blocking out the sun.. I also ordered the rods which go well with the grommets on the drapes. I highly reommend these draperies. I ordered these curtains in three colors: Beige, Gray and Navy. The Beige didn't block 100% of the light and the Gray was more of a blue-gray, so those went back. But the Navy worked out perfectly. The color is a true, deep navy that looks very nice with my navy walls (BM Hale Navy). The fabric has a satin-like sheen to it, which adds a nice bit of texture, and it drapes BEAUTIFULLY. So often blackout curtains have rubbery liners (like you find in hotels) but this is just a solid piece of fabric that looks identical on both sides. I paired them with a 1" brushed nickel curtain rod. I was a bit nervous about the antique bronze grommets, but it worked out ok. The darker metal blends in enough with the dark fabric that it's not noticeable next to the nickel, although that wasn't the case for the Beige and Gray. The fabric truly does block 99% of the light. You can see tiny pinpricks of almost light on very bright days, but the room still remains almost pitch dark. 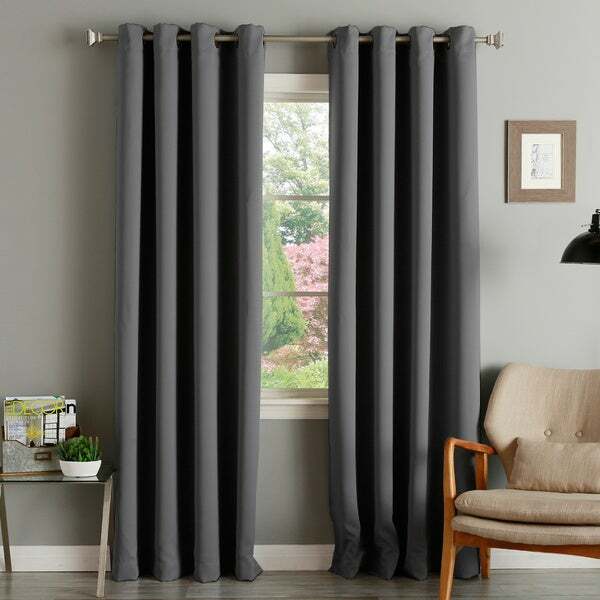 Remember that light will still come in above and below the curtain, so I recommend buying these at floor length and installing the curtain rods a few extra inches outside the window frame for maximum darkness. I've had the curtains for about a year and they've held up great. I haven't really noticed the thermal quality of the curtains, though. In the summer it didn't seem to make a difference with heat (perhaps because the dark color absorbed as much as it blocked) and in the winter the room is no more or less drafty with them closed. But I don't find it hard to believe other reviewers have had success there. The Grommet Top Thermal Insulated 84 inch Blackout Curtain Panel Pair arrived within 5 days of the placed order. They were exactly as ordered with a perfect rich looking color and complimented the room.I Placed them in the dryer for 5 minutes and any wrinkles were gone .I highly recommend this product as we are more than satisfied with the ease as they open and close and the blackout feature is true to its description. I purchased 5 prs of these curtains in CHOCOLATE BROWN for a new addition to our home. These curtains hang very nicely and are a great addition to our new room! Had bought some cheaper curtains also, but they couldn't stand up to the curtains from Overstock!! I am now considering purchasing another pr in a different color for a bedroom. LOVE THEM!! I liked the feel and the look of the olive panels I ordered. However, the lengths of the two panels were a couple inches different. Also, one of the panels jutted up a couple inches from one end to the other. It was impossible to make them look good next to each other, so I had to return them. We have these drapes over the patio door in our den which has very bright southern exposure. They have been up for several weeks now and we are very satisified with the quality and performance. They do a very nice job of blocking the light when it gets too bright in the afternoon hours. We were pleased that these drapes did not have the white thermal backing and give a much more appealing look from outside as well. More color selections would be a plus, but we could not be happier with this purchase. I just got my order yesterday, and I have to say they are FANTASTIC! Extremely high quality fabric, well-made, and live up to everything in the product description. I highly recommend these curtains! For the most part I like the product. My only disappointment came with the varying lengths of the drapes. One panel was 84" and the next 83 1/2". The range between the 8 panels I bought was a whopping 1.5". I am now having to pay a seamstress (I don't know my way around a needle and thread very well) to make the drapes uniform in length. I can not stand to see some of them dragging on my tile floor and others with a gap of a half an inch. Other than the length issues, I am enjoying the product. I would recommend them more for shorter windows where length is not such an important issue. As far as their black out quality and insulation value they get an A+. I am furnishing (a bit in advance) an almost completed house. Primary consideration is being given to the window coverings, even though we live miles from the nearest observer. Being a night owl, I prefer the stars in the evening to the sun in the morning. These really answered my needs. The weight is good. Some reviewers suggested 10 minutes or so in the dryer with a wet cloth to shake out the wriinkles. Good advice. I hate ironing. I don't feel like a mole, in eternal darkness, and since my double paned windows are currenty leaking air like a ballon with 40 small holes, the drapes are holding back our 40 mph north winds more than adequately. It is too soon to speak of energy savings, as everything in the house is new and upgraded from our 20s farmhouse. Things will be much cozier all around, and the drapes get their share of credit. The price was a nice surprise as well. I have hunted online and in stores when I get near one, and could not match quality,, color and price with what I ordered from Overstock. Shopping at Overstock is usually my first and last resort. Checkout O.co, cruise the competition, read the reviews and come back here. I bought these curtains in red and black for 10 and 13 yr old boys rooms. The red is a dark red. Hung on black rods. The first morning, my 13 yr old got up at 8:30 & thought it was still the middle of the night & went back to sleep for another peaceful 2 hours. They are not frilly or fancy, perfect for boys rooms or very contemporary rooms. Wouldn't work in the rest of my house which is more traditional, but I'm pleased at the quality for the purpose intended. Really like these curtains! Nice thick fabric and well made with a good lining. Blocks light very well! Color is accurate to photos shown. Just as described. True blackout curtains. These curtains are luxurious with it's rich color and thick fabric making them perfect for the bedroom. They are wrinkle free right from the dryer so no need to iron. Great quality material, reasonable weight to hang with out creases. Blocks light and a great asset to hold temperatures in the upper Midwest. Good value! These are my second set as I moved and had to get shorter ones. The color is lovely, they're nice and of thick quality, and they instantly make my home more cozy. I love these curtains. They hold up well, and the fact they are black out is a plus. the curtains are very good quality. "Is the 52 inches for both panels or just one?" This listing is for a panel pair. This product is a set of 2 panels, and each panel is 52 inches wide. So the total width would be 104 inches. "I want to order 2 of these but I discovered in chat support that Overstock doesn't have the correct rods to go with it. Can you tell me what rods that I need with these curtains?" "The SPECS section lists orange as a color option, was going to order, but is not a color choice?? HELP!!" "What is the weight of the panels please?" There very thick and heavy. It really keeps the heat out. I love them. "Is the olive color the same as the green listed in the 72 inch Aurora Home Thermal Insulated Blackout Grommet Top? Will the grommets fit over a 1.25 diameter rod?" "Is the size stayed per panel?" Each panel measures approximately 52 inches wide. "Do you have black in stock? I'm not seeing it under the color options. " The black color is listed as onyx in the options. We apologize for the confusion.